ITALY - Significant declines were seen in shipments from Denmark and France, which were down 18 per cent and 27 per cent respectively. The dominant importer, Germany, also reported volumes down 2 per cent on the previous year. In contrast, Spain and the Netherlands somewhat counteracted the general trend, with volumes respectively rising by 7 per cent and 1 per cent on the same period last year. 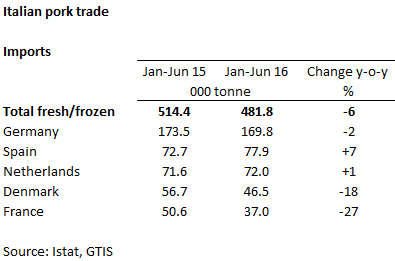 Import value was down ahead of volume, falling 13 per cent on the first six months of 2015, to €808 million. This reflects a 7 per cent decrease in the average unit price paid during this period. Conversely, the live import market has grown year-on-year in the first half of 2016, with numbers up 21 per cent to 841,000 head. Around half of these pigs came from Denmark, who showed a 10 per cent increase in shipments. Though from a small base, pork export volumes increased during the first six months of this year by 36 per cent, to 43,000 tonnes. Shipments to Hong Kong more than doubled, while the Japanese market also showed growth of over 30 per cent. May and June saw export volumes increase by 70 per cent on 2015, as export volumes to a number of Eastern European countries expanded significantly. Exports of Italian hams also showed growth, up 15 per cent on the first half of 2015 to 13,600 tonnes. The Spanish market continued to grow significantly, with Spain now accounting for a quarter of shipments.